Here Are 7 Perfect Things To Pump Up Your Party. Get Ready! For any party planning crunch time. While you’re busy making your grocery (and liquor) store runs for all the yummy goodies you’ll provide, you might want to stock up on some water balloons, Brita filters and a kiddie pool while you’re at it. Take your party from fun to fantastic with these awesome fun tricks. Your guests will appreciate it. 1.) Freeze water balloons and throw ’em in a tub with the drinks to keep them cool without worrying about dirty water. 2.) Instead of small ice cubes, use a big block of ice to keep your punch perfectly chilled. 3.) Don’t worry about losing your bottle opener by getting one that attaches to your wall (or the less permanent magnetic kind for your fridge). 5.) 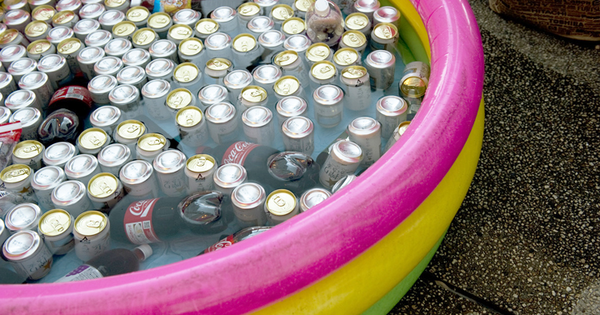 Use a kiddie pool to create one giant drink cooler. 6.) Save on speakers by using the cheap solo cups you got for the party anyway. 7.) Serving tonic? Breakout the blacklight for some trippy fun. Bonus: for the ambitious party planner, try this epic upcycled chandelie.